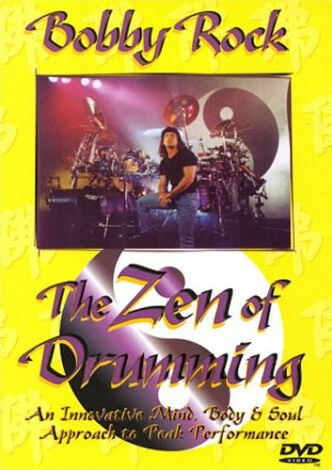 Tiger Bill reviews The Zen of Drumming by Bobby Rock. If you're not familiar with Bobby Rock, he's a modern day renaissance man who is an internationally renowned performer, music educator, writer/author, producer, health and fitness specialist/consultant, and CEO/Founder of both Paranormal Records and Zen Man Publishing. Whew! And I thought I wore a lot of different hats? Bobby has put out a three-hour DVD called The Zen of Drumming. The hype reads, "Rock shares a lifetime's worth of drumming knowledge and inspiration as he bases the program on his innovative mind, body and soul approach to peak performance. Other video highlights include: A healthy eating section where Rock discusses and demonstrates some of his superior health for musicians; eating concepts, a segment on mentally preparing for a performance, and the many philosophical food for thought sections that tie in effectively with the video's unmistakable Zen theme." I'm into drums and the health thing myself, and I've also meditated in conjunction with my martial arts training, so the video sounded intriguing to me. Here's what I discovered. Sitting behind more drums and cymbals then I've ever seen in one drum set, Bobby opens the video with an extended solo. I must admit that, at this point, I was wondering if this was going to turn out to be another solo showoff session in the guise of an educational program. But Bobby soon proved me wrong. After the solo, he talks about developing the proper mental environment that enables one to play at a consistently high level. Next, he identifies the gear in his huge touring drum kit, including: seven various sized toms, four bridge drums (that use Peavey's Radial Bridge technology), three timbales, three tube of doom drums, two Bobby Rock snare drums, and a solid brass Sonor snare. And that's not all. He also uses a slew of Sabian cymbals, cowbells, and nine foot pedals! He has five of the pedals for his left foot (he plays one with each toe - only kidding!) and four for his right foot. By placing his foot halfway between pedals (I'm serious now), he can get a bass and hi-hat sound simultaneously with one foot or a hi-hat and cowbell, etc. Cool. In this segment of the video, Bobby defines his three major elements of drumming: Mind (conceptual), Body (technical), and Spirit (emotional). He demonstrates by playing a song from his "Out of Body" CD and then analyzes his performance from the conceptual (mind) standpoint. Bobby's breakdowns of the various rhythmic patterns here will be of great interest both to beginning and intermediate level players. Not only does Bobby show us the exact parts he's playing but he takes it a step beyond this, explaining the importance of special techniques like ghost notes. He also breaks down some of his fills and explains how varying them from night to night in the same song can keep things exciting and creative. Although you'd never tell from all the sound sources in Bobby's kit, he feels that the basis of all drumming begins with the practice pad. And I couldn't agree more. Here he demonstrates how to develop ghost notes and how to use different stick levels to infuse your playing with dynamics. He also shows how a simple pattern that is played on one sound source can be changed into a complex sounding creation simply by playing each hand on a different sound source. Bobby stresses the importance of practicing rudiments and applying them to the kit. By taking what he demonstrated on the pad using only two sound sources, Bobby demonstrates how a simple rudimental sticking pattern can be made to sound extremely complicated when played between multiple sound sources on the drum kit. He calls this simple one-bar pattern the Octopus and he plays it on 22 different sound sources! Real cool. The camera work and editing on this video is top notch. I like the way the editors included small insets in various corners over the full screen to show what Bobby's feet are playing, while not loosing sight of what's happening on top. In this segment, Bobby compares a drummer practicing rudiments on a pad to a boxer practicing his punches on a heavy bag. No matter how good the boxer gets, he is never good enough to quit his workouts. It's the same thing with a drummer. No matter how good you get, you should never quit practicing your rudiments on the pad. Here Bobby plays another selection from his "Out of Body" CD and this time he breaks it down into the technical (body) aspect. Again, these sections include material that can be of tremendous assistance to beginning and intermediate players, as it helps them to understand exactly what makes up the actual grooves and solo patterns that they hear the pros play. Bobby not only breaks down his own patterns but also explains how you can go about developing patterns of your own in the woodshed. He gives you much food for thought here as he demonstrates right hand ostinatos against various left hand patterns, eventually working up to full four-way independence on his huge "Zen" drum kit. Especially check out the way Bobby plays a steady rhythmic pattern with three limbs against a left hand part that varies in tempo from fast to slow and back again. Very cool. No matter how many drums Bobby plays, he always ends up coming back to stress the importance of working out on a practice pad. His suggestions include playing with sticks that are heavier than the sticks you normally use on your kit, playing with a folded T-shirt on your pad to hamper the bounce of the sticks (making you work harder), and he offers his own slant on exercising with stick weights. In addition, he demonstrates exercises for developing your weak hand and explains how he developed a faster Single Stroke Roll. He offers plenty of good tips in this segment like eating four to six smaller meals a day and sticking with raw foods for superior health. This is Bobby's third major drumming element, the first two being the conceptual (mind) and the technical (body). He refers to the emotional or spiritual aspect as something that is hard to define yet when a drummer who lacks it plays, you can tell immediately! Bobby plays the third and final selection from his CD "Out of Body." He then breaks it down. This time concentrating on the last of his three critical drumming elements, the emotional (spiritual) aspect. Bobby talks about the importance of "being in the moment" and playing with a "vibe." And again, he breaks down the main patterns played in the song for you. He concludes this section by applying them in an extended drum solo. In this segment, Bobby explains his visualization technique that utilizes Zen based breathing and meditation. Bobby tells us to breathe in while visualizing a white light entering our body, and breathe out while visualizing a white light leaving. Bobby goes back to the pad again, but this time he's holding two Chinese health balls in one hand. He demonstrates how spinning the balls around in a hand can benefit your drumming through the stimulation and relaxation of the hand. This is a good alternative for a quick warm up when you can't get to a practice pad. He also uses a Swiss Triplet to explain how he applies his "Motion Mantra" system to practice pad workouts. Bobby covers his concept of working with a metronome and demonstrates exercising with weighted sticks as a way to warm up your upper body in preparation for playing the kit. Bobby admits that he loves to solo and it shows. Here, Bobby explains his approach to improvising a drum solo and then demonstrates each point. Again, intelligent use of video inserts over the normal full screen view allow us to see Bobby's feet and various angles of his playing at the same time. He also discusses his use of the multiple foot pedal setup to play a clave pattern with his right foot and reverse clave with his left foot, while playing various patterns with the hands against the ostinato foot patterns. You'll find quite a bit of useful material for the woodshed in this section. We're back to the practice pad in this segment to discuss the important role that monotony plays in drum practice. Bobby feels that it allows you to develop speed, endurance, and control, and he offers many exercises to help you improve your skills on the pad and ultimately, on the kit. Again, I agree with Bobby here. In my early days of drumming, I practiced the same monotonous exercises over and over for 4 to 8 hours at a clip. But it paid off in terms of some terrific chops. Nowadays, even with my busy schedule, I still try to get in a couple of hours on the pad on a daily basis. Like a wise sage, Bobby summarizes "The Zen of Drumming" by relating an ancient Zen story that contains a lesson any modern drummer can use. The closing of the video features some exclusive "Roadcam" footage of Bobby playing an extended drum solo, which was filmed on tour. Three hours is a long time to sit and watch a video, any video, let alone an educational one! But whether talking about good nutrition or demonstrating patterns, fills, or extended solo ideas, Bobby keeps things interesting (and keeps us awake). You'll find a ton of vital info in The Zen of Drumming that will keep you in the woodshed for a long time to come, whether you're a beginner, intermediate, or advanced player.